When you hear those two words, you think of four Liverpool musicians named John, Paul, George and Ringo. Not so at the Santa Barbara Museum of Natural History. Say "beetles" and that means insects. Lots of insects. When Michael Caterino, the museum's curator of entomology, speaks Wednesday, Feb. 18 at UC Davis, he'll be talking about patterns of diversity in Southern California beetles. And their names are not John, Paul, George and Ringo. Caterino's talk, sponsored by the UC Davis Department of Entomology, begins at noon in 122 Briggs Hall. UC Davis entomology doctoral candidate Fran Keller, who specialies in beetles (Coleoptera), will introduce him. "I first met Mike on the top of the Caliente Range in the Carizzo Plain National Monument down south," Keller said. "I was taking Entomology 107 and we were on a field trip. It was hot and nobody was around, but Mike and another gentleman were up on the ridge collecting butterflies. We chatted and he helped catch some butterflies for my collection, willing to share." "However, I think that as a Coleopterist, had I been collecting beetles, he might not have been so willing to give up his recently collected beetles," Keller quipped. You can see many of her beetle photos on her Web site). Caterino, trained at UC Berkeley and the Natural History Museum in London, joined the museum staff in 2001. His primary research specialty is the taxonomy and evolution of an obscure, but diverse family of beetles called Histeridae. 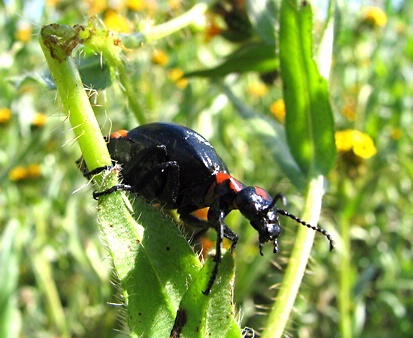 He recently initiated the California Beetle Project; he is surveying some 10,000 species of beetles in the state. Oh, and those butterflies Caterino was collecting on the Caliente Range? Probably swallowtail butterflies. His research interests include not only beetles and Jerusalem crickets (potato bugs), but the swallowtails.